Architecture is the purest form of art allowing human beings to become inspired and emotionally connected to their surroundings. 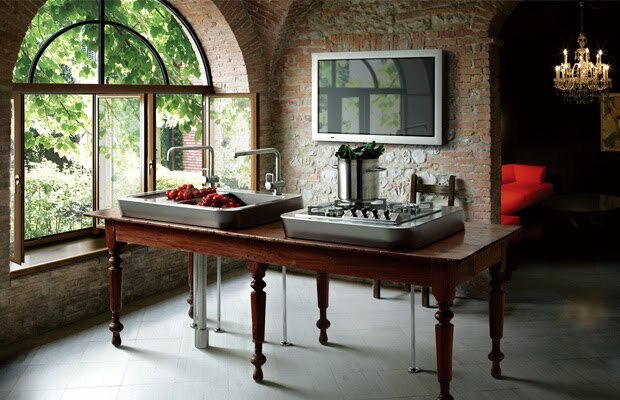 In the 21st century the kitchen has become as important as the architecture that surrounds it allowing the user to gain pleasure from its aesthetics but also fulfilling a functional role. The modern kitchen user can demand different things from a design as many people cook in different ways; pre-packaged, slowly prepared, on the run and in a social setting are all possibilities today. It is also true that the aesthetics of a kitchen can mirror our own self image and allow a certain freedom of expression with some individuals allowing the artist within them to be exposed while others take satisfaction at the social acceptance a fantastic kitchen can offer. A well designed kitchen has the ability to encourage tranquility within a home offering the user an environment that caters for their own needs and idiosyncrasies and giving satisfaction that the aesthetics chosen are from a palette individual to them. For these reasons it is important for designers to release themselves and their clients from the constraints of traditional kitchen cabinetry and become indulgent with their desires. Mixing kitchen design with artistic forms may not be a mainstream concept yet, but it opens the door of possibility, were form can perfectly meet function and self expression can reveal a great deal of satisfaction for many years to come! This is a fun design that doesn't stick to the rules...The Mogul would argue that this design, although tasteful, will prove to be more concept than commercial! 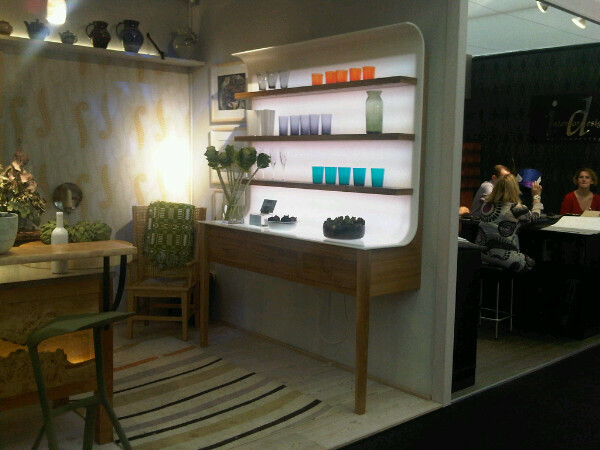 This modern Welsh dresser is currently on show on the Johnny Grey stand at Decorex. Designed by Johnny Grey and Miles Hartwell this dresser attempts to straddle the divide between contemporary and traditional. The Mogul is a fan of how light can increase the sensory pleasure of the viewer and how its use can have holistic advantages for the overall architectural space. The use of coloured glasses and translucent tableware allows this piece of furniture to become personalised and also changes the look of the design making its use an interactive experience. The Mogul always considers that a kitchen is not always being used and using light in this way allows kitchen furniture to become a stunning backdrop to our home lives. This design has its styles polarised so much that it can be likened to a Centaur, a mythical creature that is half horse and half man! Angular, Artistic and Authentic…..Enough Said! This island presents itself as a cool, dark monolithic block with some hidden features. The cooking area of the island slides back to create a cantilevered informal seating area, this function also allows the user to easily access the storage drawers beneath. The Mogul particularly likes the simple but incredibly effective wine storage area on the front of the island. The use of lighting shelves in this area breaks up the rigidity of the island design and introduces an interactive feature that will change over time. The introduction of new or differently coloured bottles will change the appearance of the island and the texture of the lighting. This idea softens the design and allows for an expression of self. The use of light in this way can have a calming effect on the viewer. The minimal, shape shifting bank of units behind the island is a fitting extension to this idea. 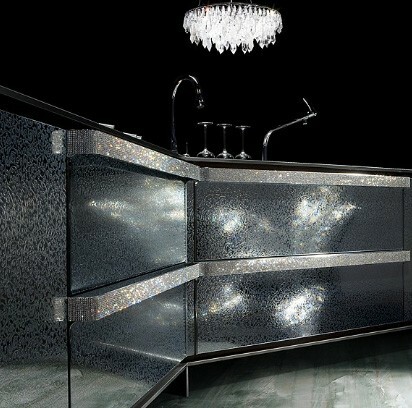 This kitchen is a perfect example of how a designer can use self expression in every creation. This avant-garde design originates from the pen of Belgian designer Joe Wynant and it shows that there is a growing trend towards an artistic expression within kitchen design. 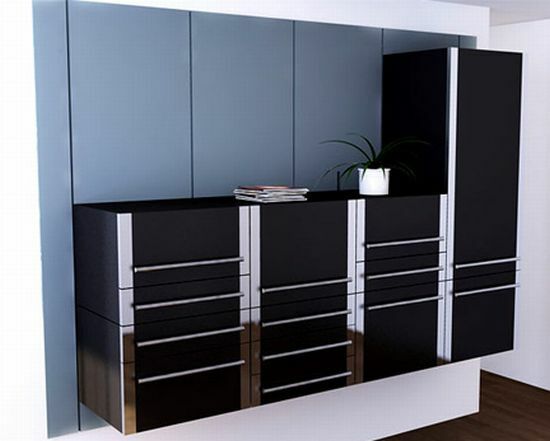 This design remembers that the world in which we inhabit allows us to see things in three different planes and therefore cabinet frontage does not need to sit at a ninety degree angle to the floor. This concept speaks volumes for kitchen design as a fashion, as a style influencer and as a discipline that encourages artistic flair. 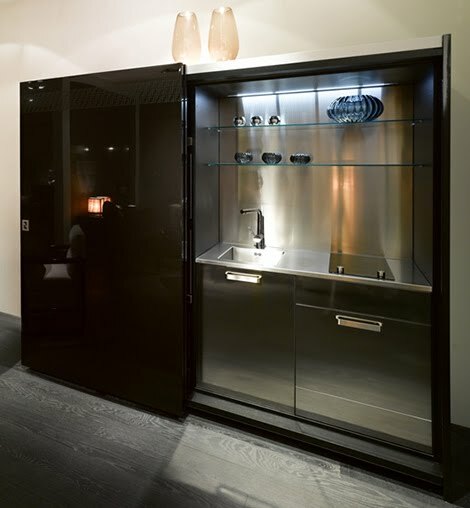 The main sink area encourages the idea of strong European techno culture with its sharp angles and clean lines, the tall appliance housing is reminiscent of an Icelandic sauna, and the island encourages the cabinet maker’s skill. Mixing these ideas together gives this design an edge and puts it outside the box of standard kitchen design. With every new idea there can be a certain amount acclaim and criticism. The Mogul wonders if this concept will require a certain dilution to become acceptable in today’s market. Fashion is often toned down before it becomes acceptable and embraced by the target market. 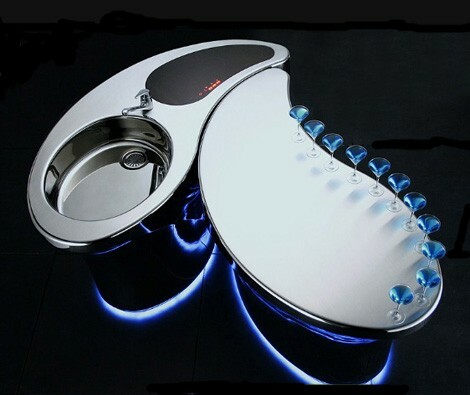 New ideas push the boundaries of our expectations and this design has to be praised for that! Kitchen design is now as important as architecture, it is as important as Art and it is slowly evolving into a discipline that can be appreciated by those who have an eye for style. No longer should a client be faced with a choice of dull timber finishes for their kitchen, they should be allowed to explore their imagination to facilitate the fusion of their personalities into a product that will share their home for a very long time. 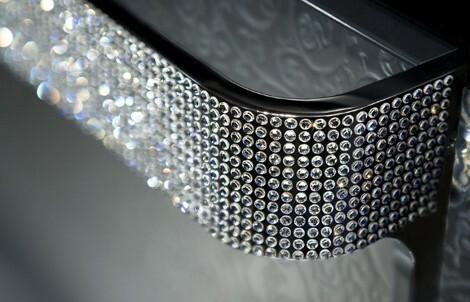 The next time a client asks for something different why not suggest custom etched glass doors and Swarovski encrusted crystal handles. Some kitchens can be hidden, designed to appear when necessary and disappear when no longer needed. 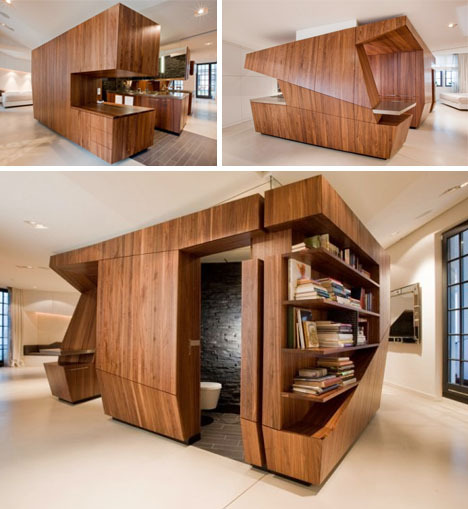 The unseen kitchen is a "Shape Shifter" that allows the user to dictate its presence within the surrounding architecture. It can be argued that the development of the hidden kitchen is facilitating the removal of many of the key sociological elements required to make our world work. The kitchen is not just a place where food is prepared; the kitchen creates a sense of place, a sense of home and encourages social interaction between family and friends. It could also be argued that if the kitchen is only occasionally present we will require our meals to appear more instantly. The basic function of food preparation will no longer be welcome within this alien, open planned space which no longer features a visible kitchen. The Mogul believes that clients will always want to see what they have purchased and appreciate the choices they have made along the design path. Any kitchen design should be personal to those who will use it and therefore they should be allowed to bathe in the social acceptance that a fantastic kitchen can bring. It is better to dilute the kitchens dominance as opposed to removing it completely. Kitchen design has been underestimated in the past. Let’s hope that designers don’t remove it from our future! 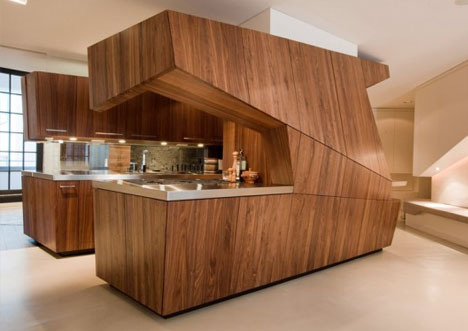 This idea explores the possibility that a "Shape Shifting" kitchen can be modular with movement restricted on a vertical plane. 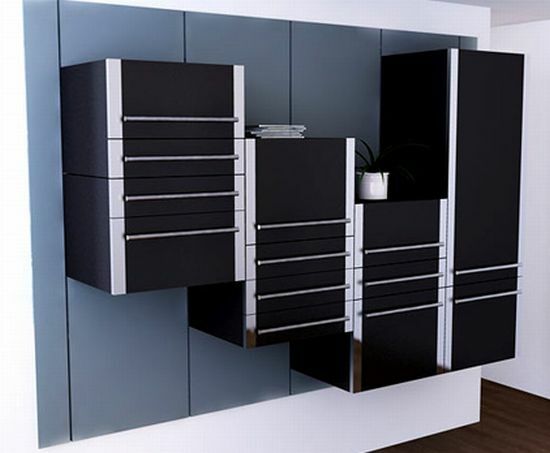 In certain positions it looks like a filing cabinet but this design can cleverly morph into a functional kitchen. This could be good when space is restricted but The Mogul feels that the finishes used could be softer in order to make the design less obtrusive when placed in the "Standby" position. Questions may also be asked about the practicality of this concept! 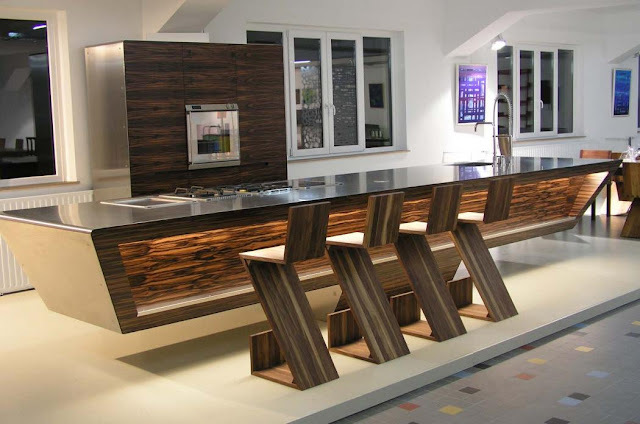 Designing an island kitchen is an enjoyable experience for most kitchen architects. An island can present the opportunity to break away from the constraints of the surrounding architecture. 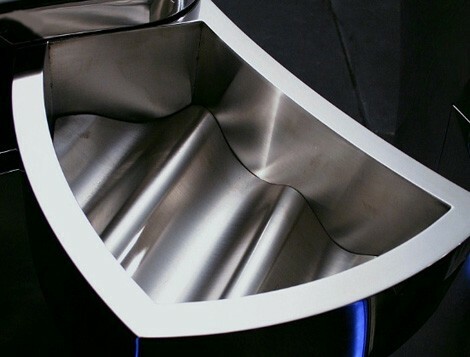 This can allow the introduction of custom shapes and materials allowing the design to become more intricate and layered. 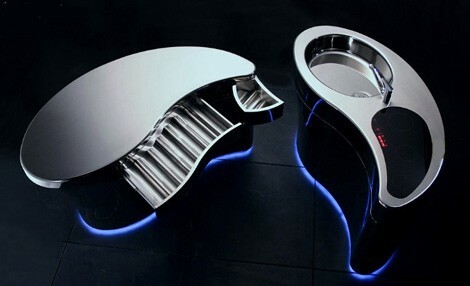 This design from Tokyo Kitchen has a futuristic appearance that embraces the “Shape Shifting” ethos. This compact and practical design is prefect for a confined living space and allows the user to physically interact with the design. The corrugated drawer bottoms are both artistic and practical allowing an un-orthodox option for storing consumable and non-consumable items. This is not what the masses expect from a kitchen; this is something that pushes our expectations of what the kitchen may become. 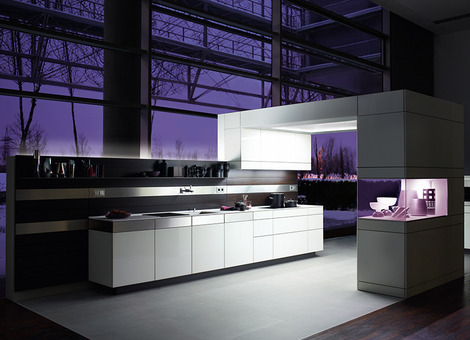 The kitchen of tomorrow will be visible when we want it to be but un-obtrusive when necessary. 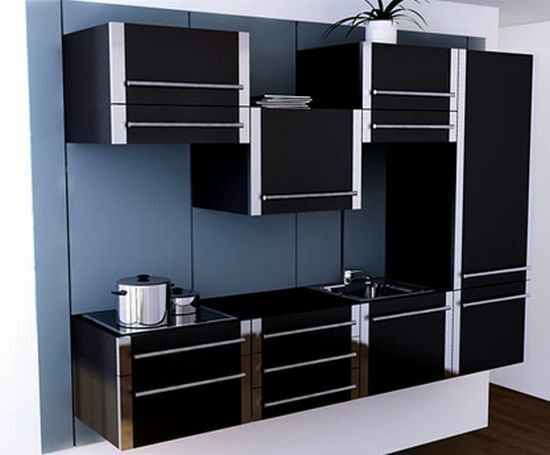 Not everyone will have the space or budget for a lifestyle kitchen but it is by considering future possibilities we will shape the diluted designs of today. This idea pleases the Mogul! This design evokes notions of airships, men in leather flying helmets and the Charleston. This art deco style is perfectly made and appeals to a niche client who really wants something bespoke. The mixture of wood, stone and machined aluminum allows the viewer to appreciate that this kitchen is naturally industrial. 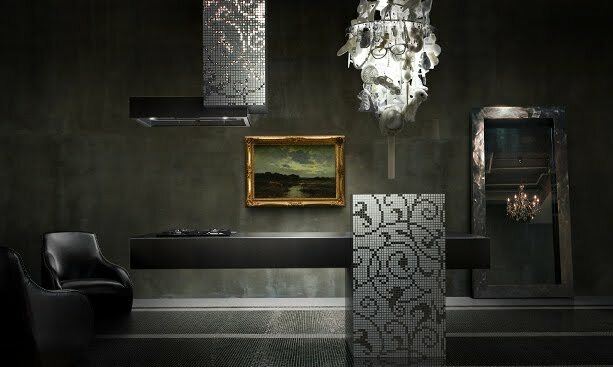 There is great craftsmanship in this design and it is a true attempt to mix the old and the new. Using ornate wood carvings and free-hanging the appliance housing gives this design an edge. Mr Rashid had a part to play here. This island is designed to define the room. 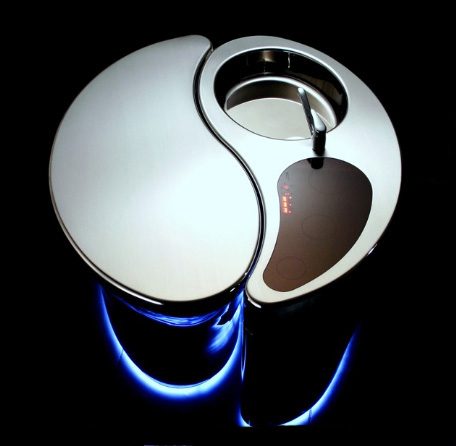 It presents itself as an artistic sculpture with its functional capabilities disguised. Choices of materials and mosaic patterns can allow for an expression of self. The cantillever is stunning, inviting the viewer to interact with the design and diluting the natural boundary that an island can create. The asymmetric nature of this design works fantastically well! This concept encapsulates the essence of modern kitchen design; it is functional, efficient, and has a technological edge that allows the viewer to reconsider their expectations of what a kitchen should be. 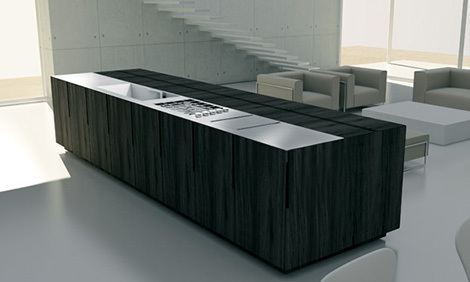 This design also considers that there can be a functional and social element to an island kitchen. 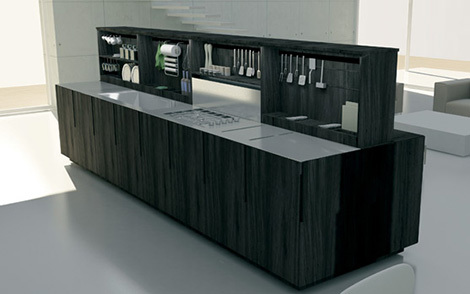 This self contained island kitchen allows mechanics to breathe life into it. The elevated centre area can contain different storage zones giving the client the flexibility to personalize the using experience. This design also looks past the primary function of the kitchen and introduces entertainment and artistic elements. 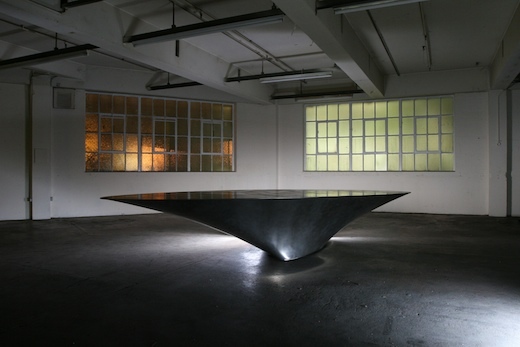 When not being used this shape shifting design can become an unobtrusive piece of minimal furniture.